It’s not so bad getting up at 6 in the morning if the view outside your window is sunny and bright. This morning when I looked outside my window I saw this little fellow making his way towards my veggie patch. I went out to take a photo of him and then noticed that things have started to happen in my veggie patch! Here’s a close-up of the action. It’s a pity that it is too cold to sit outside, because it was absolutely a beautiful morning in my garden today. I have never been good with plants, and probably never will be, but I do like to have some growing green things around me so I try to keep what I have in my house alive as best I can. Last summer we bought a house with a small garden. There aren’t much growing in it so it’s perfect for my husband and me to slowly get the hang of maintaining a garden. There was a tiny vegetable patch where the former owners had grown carrots, so I thought I would try and grow something there myself this season. It’s difficult to get much done when I only get to be creative while the baby takes a nap, so gardening is something done over several days for me. Some weeks ago I got rid of the old carrots in the ground and weeded away the worst of the unwanted stuff growing in my patch. I noticed that the carrots were small and chubby which probably was on account of the soil being rather clayey, so when I got to do some gardening today, while baby girl took a nap, I began by digging around in the patch to turn the soil. I am absolutely winging it with my grow-my-own-veggie project so if any gardeners are reading this feel free to comment and or give advise. It’s a very small patch so I had decided on only growing two small veggie things this season and have chosen radishes and spring onions. 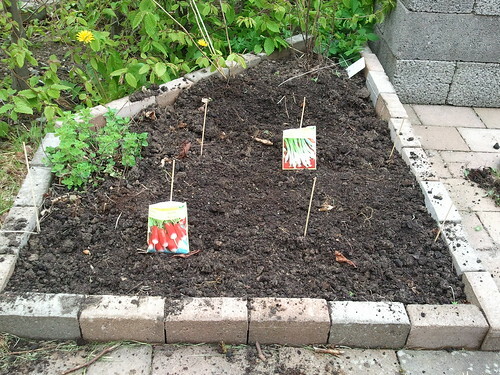 Unfortunately baby girl woke up before I started to put in the seeds, so I ended up just spreading the seeds around in stead of spacing them evenly – I am hoping I can make up for this later by removing any sprouting green thing that comes up and try to compete with it’s neighbour. Hopefully I can blog about little green things sprouting their way towards the sun soon.